So, I was giving my 22 month old son a bath last night and I got to thinking about a D&D campaign I’m currently running in the context of a ruleset I recently read. 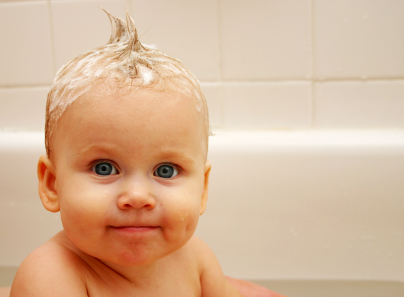 I do much of my best thinking in the shower and that holds true of baths as well, including those where I’m bathing my children. I recently read a rules-light retro clone called Ambition and Avarice. I very much liked it and will probably post about it specifically at some point. But, it got me to thinking about things I need to make sure to do, to not do and to highlight in my current campaign. Most were things that I already knew and have done, but that you often forget about in the “fog of war”; those times when you’re too busy managing the table and group to make sure you get them in each session. As I checked off the list and lathered up my sons adorable little head of hair, I realized they all held true for how I raise him, or WANT to raise him as he gets older. I’ll write them here as a simple numbered list. They are in no particular order. 1. Don’t railroad the players. This is true of RPGs and raising children. Just as you want to give your players meaningful choices and the information with which to make them, you want to make sure you’re not forcing your child down a path that you prefer. Many Dungeon Masters subconsciously steer the party toward the content they have prepared so as not to get caught and forced to improvise when they are not prepared. This is analogous to encouraging your child only to do those things you are good at or understand. But this undermines the players ability to learn about their character in the same way it undermines your childs ability to learn who THEY are rather than how much they are or are not like you the parent. 2. Play to find out what happens. This is something I’ve always done but never quite verbalized this concisely. The wording I used is pulled from a fantastic new age retro RPG called Dungeon World. If you’ve not read it, do yourself a favor and go get it now. It’s like $10 on RPGNOW. The point is that RPGs are best when you don’t have preconceived ideas of how certain things will play out. I think this is true of raising children as well. The joy of a parent comes from the discovery of who their child is, what they are capable of and what unique ideas, behaviors and creativity they will have to offer. Much of this will be a product of how they are raised, but knowing that need not spoil the joy of surprise as you watch a newly minted human come online, walking, talking and causing mischief that can even surprise someone who has seen and done “it all”. Parents who put in the time and energy will largely get good results, but those results can exist within a broad range of things. What will your kids say or do? How will you react? A good parent is like a good Dungeon Master. They’ll take in the goings on of the table and use it to create more circumstances to challenge and encourage the group. Similarly a parent can use what their child says and does to help guide their decisions on how to parent in the future. You simply can’t know what will be the right thing for each child until you see how they handle what life and you the parent throw at them. 3. Give each player a chance to shine. RPGs are about getting to be someone else, getting to do things you might not get to do in real life. And yet it’s important to let people shine as someone else. How much MORE important must it be to let someone shine in their ACTUAL real life!? If people have a need to do good and contribute meaningfully in a fantasy setting, certainly the need must exist in their daily lives. As a DM, it’s vital to assess your players, to figure out what makes them tick and what entertains them. This will allow you to give them opportunities that reward those sensibilities. Similarly, one must assess ones children and determine their likes and dislikes, what is important to them on a human level. That allows a parent to be aware of those situations where the child can contribute meaningfully toward a personal, or family goal. My son loves tools and really wants to help so whenever I fix something, he’s always there. I have him hand me each tool I need as I need it and whenever I have a piece of trash, I have him take it and place it in the trash can. He beems with joy at the thought he’s helping me complete a daddy project. He can barely make a sentence and yet he knows what it means to help. So I give him plenty of opportunities to do so. 4. Don’t be stingy with the loot. Oddly (or totally predictably if you believe this column holds any truth) this is a place I struggle in both my life as a Dungeon Master and as a parent. On some level, I know players love loot. They love getting that sweet new dagger or sword or spell. But as a Dungeon Master, it always seems part of the background. After all, I’m not using these things. I hand them out and forget about them. Similarly, children need a steady stream of praise and encouragement. Praise when they get it right and encouragement when they get it wrong. While I think it’s important to deliver these things on a granular level, there’s no point in holding it back completely. This is something I need to regularly remind myself of. 5. Be consistent. D&D is a tough thing to nail down. Players have to rely on the DM to tell them everything about the world and what’s in it. As the DM you are the conduit by which all information is gathered. The rules of the game help and guide but ultimately you have to make a lot of tough calls. You need to understand your DM style and use it as the basis for your decisions. Sticking to it as best you can. This will create a consistent and predictable world. Something that is vital to immersion and an enjoyable experience. If your players never know from one session to the next how the world will react to their ideas, they’ll feel disconnected and quickly lose interest. Similarly, a parent is the sole conduit between the outside world and the child. You need to understand your parenting style and use it for the basis for your decisions on things like discipline. Things like right and wrong, how to cross the street and what it means to show respect are things you as the parent must teach, both through explanation and example. If the two are not consistent, if you frequently don’t do as you say, the child will naturally be confused. 6. Let the dice tell a story. What are dice in an RPG but a randomizer, a way to insert chance into a game. This does two things. It allows outcomes to be unknown in advance, even by the Dungeon Master. And it creates a possibility for unexpected events that can be bad as well as good. The fact that failure can occur makes success taste all the more sweet. Sometimes it’s nice to remove the dice so that you remove the randomness. But in those times where the outcome is not obvious, or is in doubt, the dice can often tell a better story than even the most creative thinker. Similarly, we often have to take chances, as life contains risks of failure. Trying to eliminate them all, as a parent is often wont to do, is like removing the dice from an RPG. It changes it completely. But like in an RPG, lifes success is felt most strongly when a risk of failure is hiding in the shadows. The point to this is that it’s ok for kids to try things they have little chance of doing. Learning from failure is what makes failure so valuable, and eventual success so profoundly rewarding. 7. Make lots of plans but be willing to trash them. This is something similar to #1, but different. In RPGs, it’s important to have a plan. Not just to keep things running smoothly, but because then you’ll know when you’re deviating from it. Your plan is your baseline. Parents need to have a plan too. You can’t just wing it all the time. You have to be organized and ready. This takes preparation and a lot of work. But if things don’t go according to plan, you have to be ready. A good plan will help with this because a good plan will have jump off points for when things go sideways. Things like “if this doesn’t work, try this other thing”. It can be that simple. A plan for what to do when your plan proves useless. RPGs try to emulate a life. Similarly our lives try to, on some level, emulate our fantasies. At least we try to achieve our goals and dreams which are our real life fantasies. So in that same way, we have to be prepared when those efforts go off the rails. In particular when our efforts for our children go off the rails. It’s ok, just be ready and don’t let it ruin what could end up being a great experience that you just didn’t think to plan for.